Got a son between the ages of 10 and 14? Listen up. Some big changes are headed your way. Big physical, psychological and social changes that can be jarring and scary — for you and your son. I’m not going to sugarcoat things here: parenting tween boys is a challenge. One day, you have a sweet little boy who loves you more than you ever thought possible; the next, he’s annoyed by your mere presence. I spent most of my first son’s tween and teen years feeling absolutely overwhelmed. I didn’t know how to handle his intensity. His moods infected our house. And when he didn’t do what he was supposed to do, I was at a loss. How does one discipline a child who is bigger than you, stronger than you, completely determined and tech savvy? I cried. I journaled. I muddled through. I realized I’d spent the past six years or so trying to find the answer – trying to fix what was wrong with my son – when in reality, nothing was wrong. He was growing, plain and simple. His mind and body, and our relationship, were changing. He was going through a completely normal and natural stage, a stage that starts (for boys) around age 10 or so. Your son’s brain is still developing. His executive functioning — the cognitive skills he uses to assess risk and prioritize and organize — won’t mature until he’s in his 20s. Your son isn’t messy and disorganized because he’s lazy — well, not only because he’s lazy. He’s messy and disorganized because he’s still developing self-control — and because his priorities are not the same as yours. You could likely come down on your son for 10 things (or more) every day. For the towels left on the bathroom floor, the oatmeal left to crust over on the bottom of the bowl, the homework he hasn’t quite done, the dog he forgot to walk, the thank you note he still hasn’t written and the video game he’s been playing for the past hour. Don’t. If you yell at or reprimand your son for everything little thing he does wrong, he will tune you out. So pick your battles, and let some things slide. (Ice cube tray left on the counter again? I either simply fill it or leave it out.) I choose to focus my time and attention on safety, education and respect. By 4th and 5th grade, a lot of boys have mentally checked out of school. The sit-down-and-shut-up mode of learning that’s still so prevalent in classrooms doesn’t suit a lot of boys. Neither does curriculum that’s heavy on reading and writing and light on real-life, active experience. So they stop trying. They don’t do their homework or only do it half-heartedly. Boys are wired to seek meaningful real-world experiences; do what you can to help your son find ways to pursue his passions in the real world. Learn about social networking too, because it will soon play a major role in your son’s life. Snapchat and Instagram are how kids stay in touch these days; it’s the modern equivalent of spending time on the phone with a friend after school. Feeling overwhelmed and unsure how to handle the role of technology in your son’s life and friendships? Follow Devorah Heitner, author of Screenwise: Helping Kids Survive (and Thrive) in Their Digital World. 4. Stock up on food. Tween boys eat a lot. Sometime around age 11, their stomachs turn into bottomless pits. It is not unusual (or unhealthy) for a tween boy to come into the kitchen, looking for a snack, an hour after dinner has ended. So stock up on easy snacks — peanuts, tortilla chips, popcorn and fruit are favorites around here. Work to develop healthy eating habits, but don’t become the food police. Research shows that rigorously policing your child’s diet isn’t very effective anyway; all it does is create an adversarial relationship between parent and child and create a whole lot of angst and drama around food. 5. Get used to the smell of body spray. Why are tween boys so attracted to Axe and Bod body spray? I don’t know. But tween boys love the stuff, and they have not yet learned the meaning of “sparingly.” They’ll spray it on their slightly-worn sweatshirts to sweeten them up, and spray it at their brothers and friends just for fun. The upside of this obsession with scent: Soon, you won’t have to fight your son to get him to take a shower. 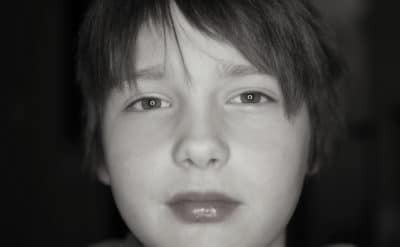 Parenting a tween boy is physically and emotionally draining. Seek support from other parents of boys (our Facebook group is a great place to connect with other parents), but don’t focus all your attention on parenting. Give yourself some down time, and nurture your soul.